Oh hai guyz! I'm what some may term a workaholic. Between business, music, reading and writing I am always working on something. In business I am currently working on growing the businesses that I currently have and developing new businesses that solve problems. With music I am always zoning out to the likes of John Williams and Armin van Buuren while shamelessly attempting to match such genius. With books I am always reading non-fiction books on various topics with spiritual and historical being my favorite. And then when I'm feeling saucy I like to write a blog post now and again. 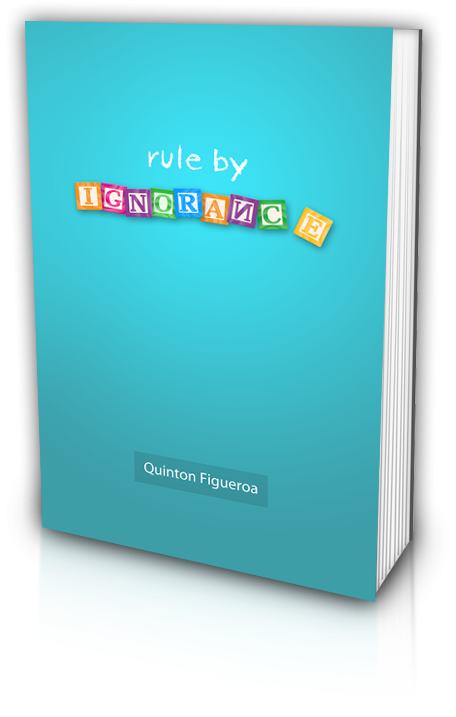 Rule by Ignorance is a look into the root cause of most of the problems we face in society. We often times see greed, fear and bad leaders as being the cause of all our problems... and they are, to a degree. But we never stop to really dig any deeper into the underlying string tying these all together: ignorance. Ignorance dominates the world. Ignorance can be found at the heart of religion, science, education and government. Everywhere we look we see ignorance ruling people rather than wisdom. This book uncovers many of the problematic areas in our lives where ignorance rules and sheds wisdom on these topics. Too often books go really deep into one subject without touching on other subjects. This can be good if you want to know a lot about one subject, but it can also be confusing because you don't see how it fits into the grand scheme of things. What good is religion if it doesn't improve our lives? What good is science if it leaves us without hope? What good is education if we come out less creative than we started? What good is government if all it does is restrict us rather than enhance us? This book is all about taking a step way back and seeing how all these subjects fit together. Kronos Capital is a leading, diversified investment management and advisory firm. DBD.NET is a Web Design & Internet marketing firm. DBD.NET harnesses decades of Internet experience and provides this expertise to hundreds of client on a daily basis. Music has always been a large part of my life. I started playing piano as a young child and continued on with the guitar in middle school. Music has a way of connecting and establishing deep memories which provide inspiration and drive innovation. Music is a way to share a universal language with everyone. Music is more than sound, it is a story. Music takes you on a journey deep into yourself where you are able to activate something that would otherwise lie dormant. I enjoy all types of music. My favorites are film scores, trance and metal. Some of my favorite artists include John Williams, Hans Zimmer, James Horner, Armin van Buuren and Amon Amarth.